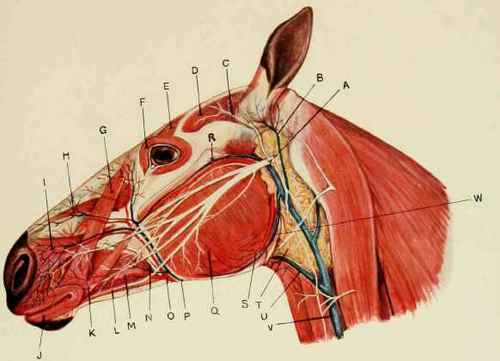 Anatomy Of The Horse's Head. G. Levator labii superioiis alseque nasi. H. Levator labii superioiis proprius. I. Dilatator naris lateralis. J. Orbicularis oris. B. External carotid artery. c. Internal carotid artery. D. Occipital artery. 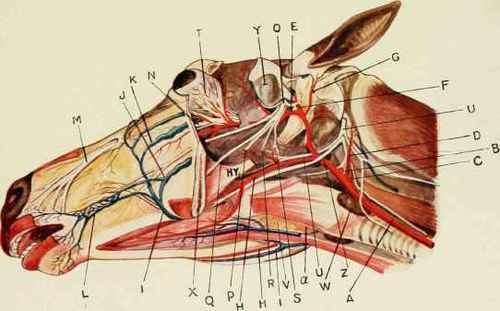 H, H. Right aud left submaxillary artery. I, I. Right and left submaxillary veins. Q. Lingual or gustatory nerve. T. Ophthalmic nerves and vessels. x. Section of lower jaw. z. Hypoglossal or twelfth nerve.